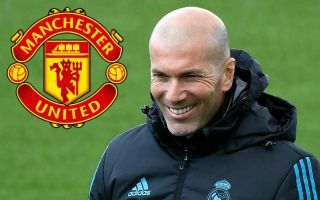 Manchester United sources have responded to talk regarding hiring Zinedine Zidane as their new manager to replace the struggling Jose Mourinho. Unfortunately for Red Devils fans hoping for a change in the Old Trafford dugout, the response was a pretty blunt ‘no’, for the moment at least. ‘Why would we discuss Zidane when there is no job available?’ a United source is quoted in the Times, following speculation the French tactician had been sounded out over the position. Zidane did great work in his time at the Bernabeu, winning three Champions League titles in less than three full seasons in charge of Real. However, he stepped down at the end of last season, perhaps with the somewhat sensible view that things could only go downhill from there. It had recently been reported by L’Equipe, translated by Get French Football News on Twitter, that Zidane was keen to move to the Premier League next, with United also named as his favoured destination. There seems no doubt Zidane would be a strong appointment for United as they continue to stall under Mourinho, who seems past his best at this level. The Portuguese is yet to get the best out of a talented and expensively-assembled Red Devils squad, with the football uninspired and not what the fans became used to under Sir Alex Ferguson. Zidane’s work at Real could mean he’s ideally suited to get more out of a squad of big egos and superstars like Paul Pogba and Alexis Sanchez, but it seems it’s not happening any time soon.